Matt Garza often has issues throwing to first base and the Athletics—who attempted four bunts yesterday, including Coco Crisp's game-opening single and Eric Sogard's sacrifice immediately after—had an obvious plan to try to get in Garza's head. Turns out, it worked. 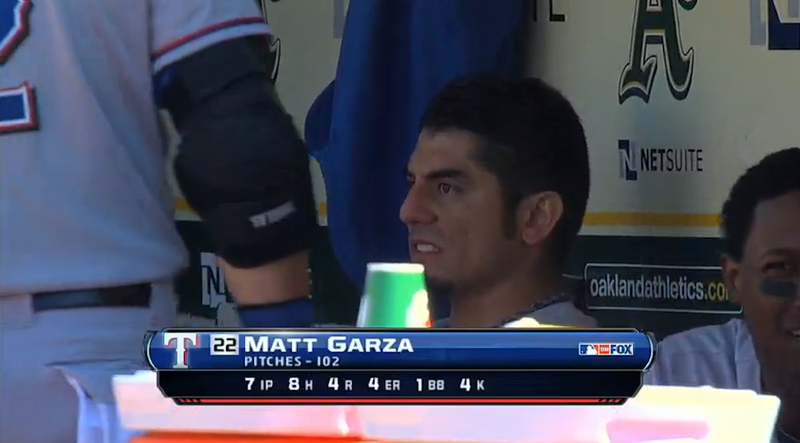 Also turns out, Matt Garza has issues with anger and women. After the seventh inning in Oakland, when Sogard successfully executed another sac-bunt, this time a safety squeeze to take a 4-2 lead, all three issues began percolating. After the loss, Garza went off on Sogard, and his wife Kaycee, because he's a man and this is a man's game and he's not at all rattled by having his weaknesses exploited. It's unclear what Kaycee may have said to set him off, there's nothing on her account directed at him except for a tweet where she alludes to a missing (or deleted) tweet, but does it really matter? It's not as though he was threatening, but he responded in a totally misogynistic and meat-headed way that's pretty impossible to justify. Some of his tweets aren't even complete thoughts. When Garza was asked after the game what he said when he was jawing away at Sogard (video here), he replied he was merely asking Sogard if there were any good places to eat in Oakland. Sogard, who hadn't tweeted in a week, didn't respond directly. So far Sogard leads Garza 1-0 in this man's game.